Halibut is a mild, light fish that lends itself well to multiple cooking techniques. You can find fresh halibut in your local seafood shop or supermarket during fishing season from April through November. Frozen halibut is available year-round. Most halibut recipes are made from steaks or filets; however, it is such a large fish (the record for an Alaskan is 1,100 pounds) that you can order halibut roasts of up to 10 pounds from some markets. 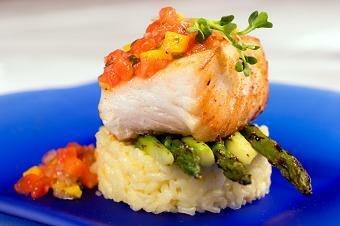 Many people who do not like fish enjoy halibut because of its delicate, sweet flavor. When it is very fresh, it is not fishy in the slightest. Instead, the tender white flesh melts in your mouth and has a sweet, briney flavor similar to scallops. When selecting halibut, sniff the flesh. It should smell slightly briney, but never fishy. If it has a fish odor, it may not be very fresh. Halibut lends itself well to multiple cooking techniques including grilling, oven roasting, and sauteeing. You can also coat it in batter and fry it for fish and chips. The fish cooks quickly and contains minimal fat. Overcooking can dry it out, so careful attention is necessary. You know your halibut is cooked perfectly when it just begins to flake with a fork. You can cook it with the skin on or remove it before cooking, whichever you prefer. Some people like filets because they tend to contain fewer bones, while some prefer the meatier, thicker texture of a halibut steak. Whatever you choose, this is a healthy dish that is low in fat and calories, contains little sodium, and is a good source of omega-3 fats. Halibut is mild and delicious, so saucing it up just makes sense. Many halibut recipes contain hot spices to give a kick to the taste but that isn't always necessary. Pair the fish with just about any other flavor, herb, or spice and you won't be disappointed! It combines especially well with delicate sauces such as beurre blanc, and has an affinity for herbs like tarragon, dill, and basil. Even if you do not like fish, give halibut a try. One bite and you will see why so many people favor this delicate, flaky fish.